Buck Titanium model 186 folding hunter mint with original black leather sheath in the box with papers. Includes the removable belt clip, screws and hex wrench. Made in 1987 in El Cajon, California USA. The blade is stamped BUCK, 186>, U.S.A., PAT. PEND. It is 5" closed. Catalog #1368. I think the original take-apart model was only made for one year. Do not confuse this one with the later model 560 that did not come apart. The Buck Titanium model 186 is the first and the best! 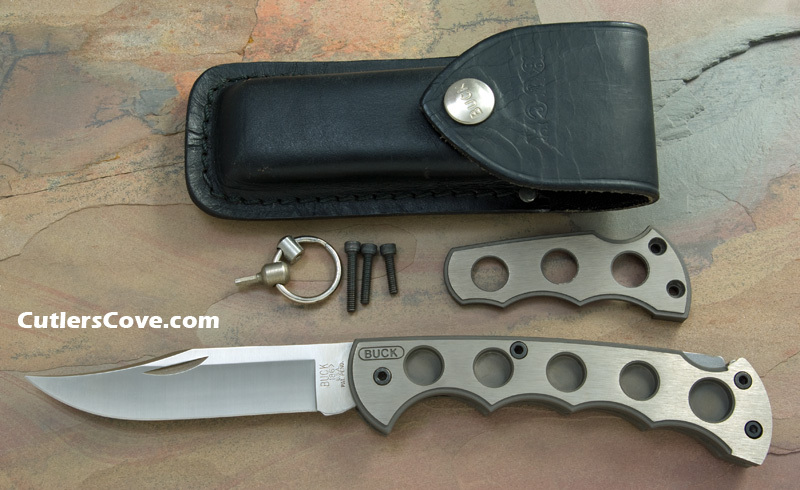 History about the development of Buck Titanium model 186 and Phrobis II, Ltd.